On Sunday, I rode Freedom in a Hunter Pace. So glad he felt good the full seven miles. Last October, Freedom’s problem with intermittent lameness came to a head. I trailered him an hour an a half to a glorious hunter pace only to find that he was so uncomfortable that I turned around and hacked him home after two miles. If you’ve been reading along with the blog, you’ll remember that I had his Sacroiliac joints injected. His symptoms were consistent with SI problems — sore back, difficult holding the canter. Unfortunately, the injections and mesotherapy made no difference. I kept him in light work and had him re-evaluated this spring. A new diagnosis emerged: Lyme. Unsurprisingly, the Doxy made Freedom feel really good. After all, it’s a great anti-inflammatory. I do think it was Lyme because most of the benefits from the treatment stuck. He could canter on both leads and he felt a lot sounder. At least he did for about four miles of conditioning work. After that, he started to feel sore. He didn’t want to canter, he flung his head in the air. He was uncomfortable. [Note: this kind of soreness can come from an ill fitting saddle but I have my saddles fitted every six months, so I was pretty sure that saddle fit wasn’t the problem]. Freedom’s been on Robaxin for about 10 days. 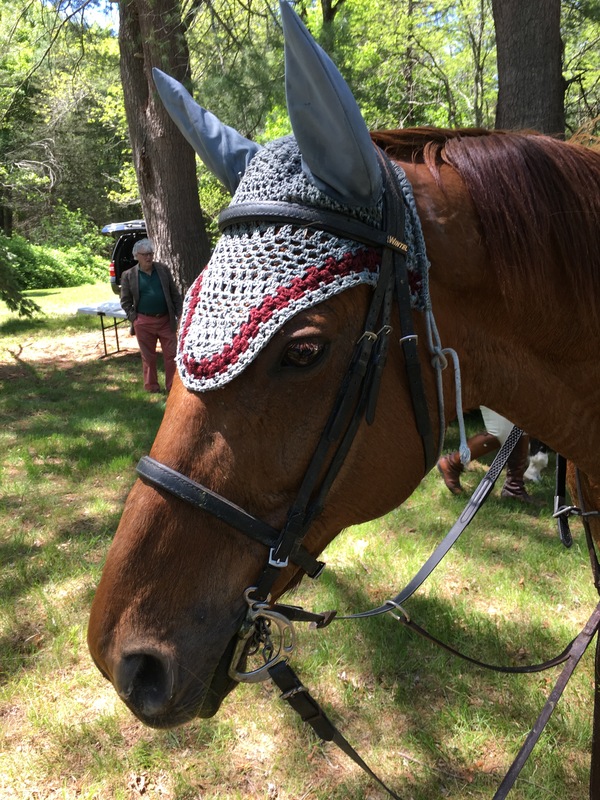 He’s felt good for shorter rides and I’ve gradually been increasing the intensity, so yesterday I put it to the test: A seven-mile hunter pace. We moved along at a good pace and jumped the smaller fences. Even at the end he was happily cantering on both leads. I know Robaxin isn’t a long term solution, but it’s nice to have my boy feeling so good again. An added bonus? We came in second! 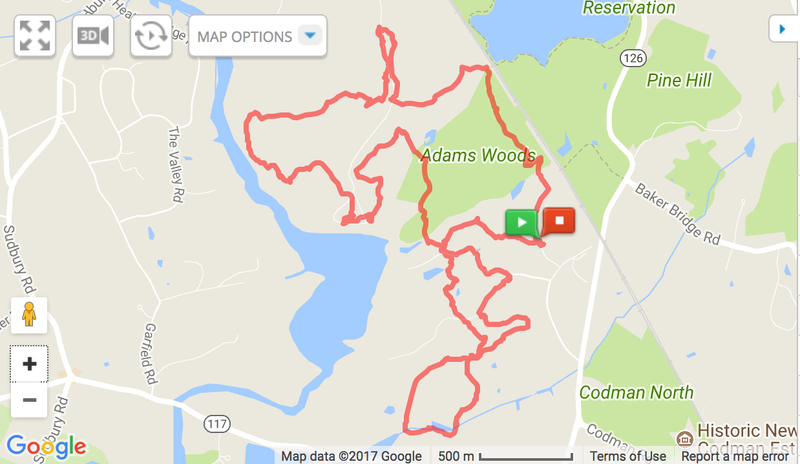 Yesterday’s pace event took us through Adams Woods, which abuts Walden Pond. It’s a lovely territory with views over Fairhaven Bay. Have any of you had experience with Robaxin? That’s great news about freedom! I’ve used robaxin with my ottb during his letdown from the track. My understanding is that some back sorenesses don’t or can’t resolve themselves bc of the horse’s tendency to compensate. So sometimes even when the cause of pain is gone, the pain stays until it gets a little extra help. Glad the robaxin made him more comfortable! My mustang mare was having real issues with taking her right lead and then we began to notice that the saddle was pulling to the right. She was over-compensating for something.. so I went through the blood testing and lameness exams. My trainer told me to have a chiropractor look at her because he felt her back was having issues. She has been through 3 adjustments and I tell you what a difference! I love to watch her being adjusted as she closes her eyes and licks. When it’s over she has a good roll.. I also had her saddle re-flocked as I was not aware that if you ride often your saddle flocking will break down within 6 months and can cause the back issues! I’m glad that you found a way to help your mare. I’m not a huge fan of equine chiropractic, but I did have a really good body worker give him a couple of massages (the difference between body work and chiropractic is worthy of a whole post!). They did help and also helped me pinpoint where he was hurting. Good point about the saddle fitting, too. I’m very lucky and have someone who checks the fit of my saddle every six months. It’s much harder in different parts of the country where saddle fitters are scarce.